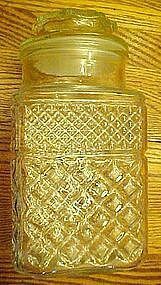 Tall clear glass square apothecary jar in the Wexford pattern by Anchor Hocking. Measures 7 3/4" plus the lid which makes it 9 1/2" tall overall measurement. Lids have the plastic seal intact too. I have 7 available and price is for each. All are perfect and have the seals.